It was another major Show and Tell at our monthly get together. Anne presented a great button tree with original painted fabric background along with fancy machine stitching. 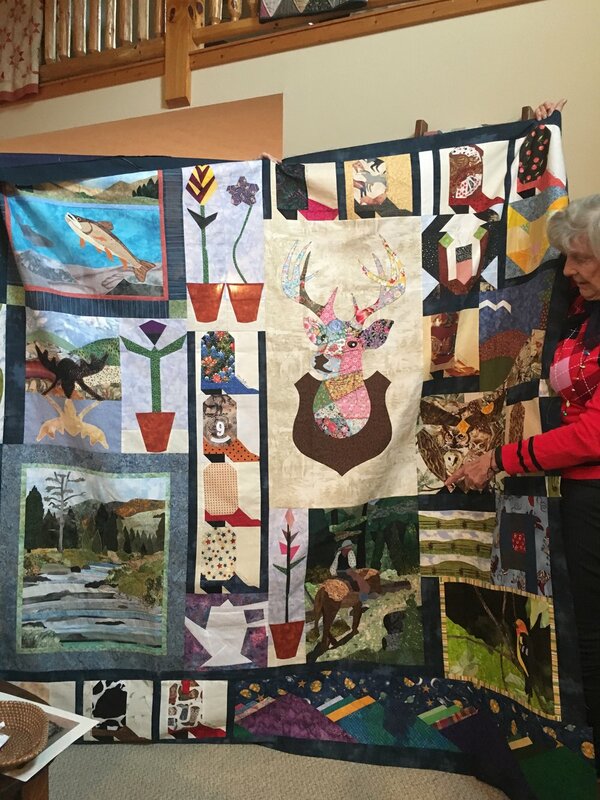 Judy has done it again with a fabulous Quilts of Valor quilt top. Some fortunate veteran will enjoy this. 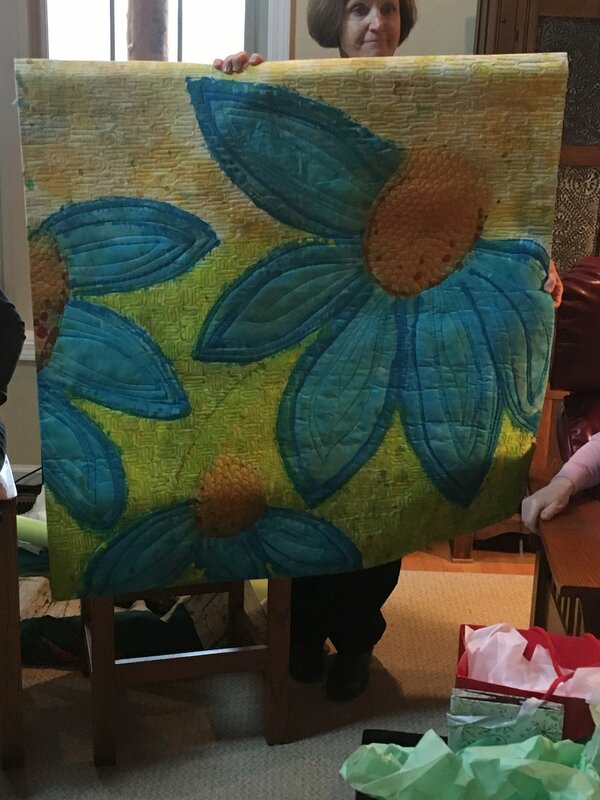 Deb presented her February block. Those border hearts are pieced in that seminole fashion of piece and re piece. Just Great! Barb brought in an antique Pickle Dish pattern quilt. Just look how graphic that pattern presents itself in just two colors. Just an update from the Quilt Built studio. After pulling all of those fabrics out it took me awhile to stack them and re organize. Even Rosie is pleased! Every year I receive a nature heart valentine from Chris Wolf Edmonds. I cherish these and have now put them into a hanging mobil right above where I stitch everyday on my BERNINA. Included is a picture of Chris on deck enjoying some sunshine from one of my Quilt Cruises. Note even her bathing suit top is heart shaped!! We have lost track of how many hexagon quilts Mary has made but she is hot on another one. She is amazing and will always go down in my history book as the creative lady who named my Grid Grip. An antique basket top, partly hand and machine pieced, got lots of raves. Note how the blocks are set so there is not an up or down. Clever woman of long ago. Judy did another Real Trip Around the World for a service person. She included some tan blocks for the Army. What a beautiful top about to go on the long arm machine with MaryAnn quilting. A star quilt for a special son. Connie always steals the show with her scrap quilts. A Feed sacks wonder. A Drunkards Path has never looked so pretty. 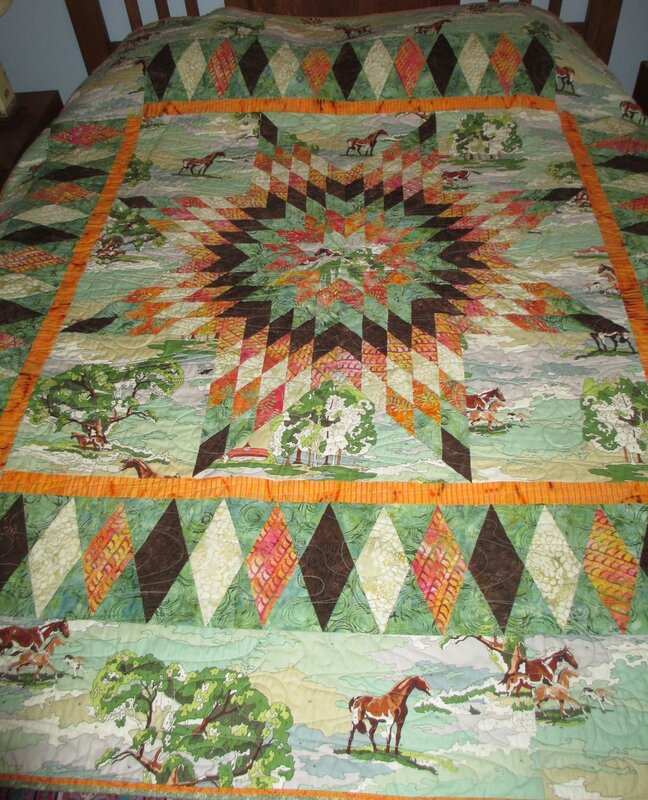 The long arm quilting in such a simple fashion sets off the border. By Connie again. More from Connie. Those hour glass center squares really set off the simple rectangles. What to set off the variety of show and tell than a T shirt top for young lady. How clever the original block with putter and ball. The grand finale from Connie, again. Known as the Pizza quilt but done here in more feed sacks. Note the half cookies on the table brought from Connie as my Half Birthday to share with all. So fun and meaningful to sign lots of my new Scrap Happy Quilts book for fellow quilters. Stay tuned for next month. 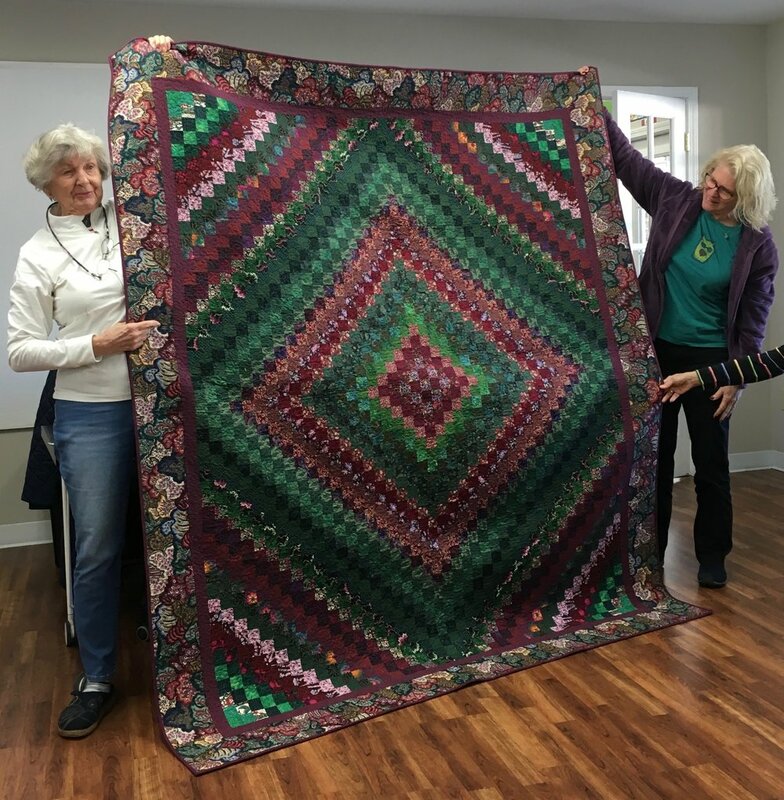 What a bevy of Bring and Brag at our monthly meeting at Beginnings Quilt Shop! 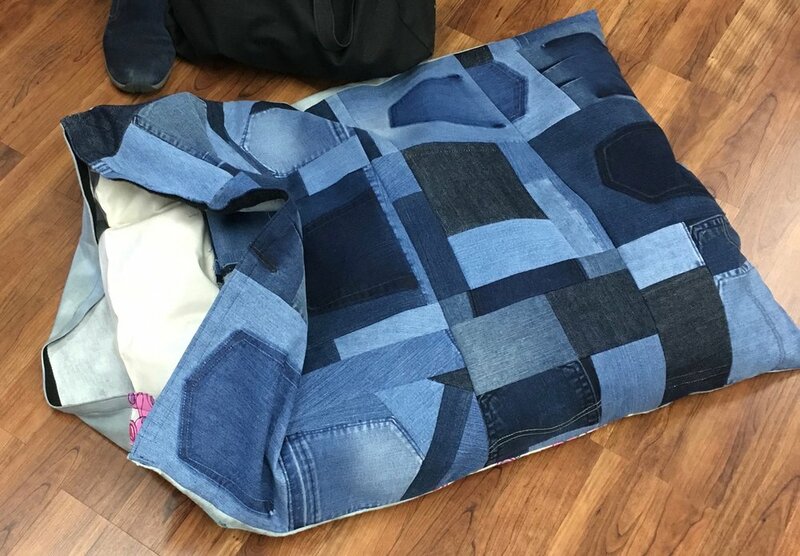 Let me also correct the December Tea Time in that it is Deb, from Travelers Rest, who made the denim doggie bed. She stars in our first “show off” for December in the beginning of her calendar wall hangings. Many thanks go to Sam Baldwin who has been my graphic artist for my new book over many years. Jackie, his wife, requested a dark green and burgundy quilt so I just had to make The Real Trip Around the World in her colors. It turned out great and I trust they stay warm. Come on down to the Hendersonville Curb Market, Saturday to buy my new book. Will sign and will have a few of the quilts there from the book. My favorite place in town. You can even get eggs, jams and other goodies. See you on the 12th-from 10:00 till 2:00 pm. I can’t let 2018 pass without a “shout out” for the Christmas PTA party. Show and Tell is the best as Kate shows off her Batik accomplishments. Did you ever collect the great cat design in fabric? Leigh Ann found a great way to use it. Barbara Shows off her wine wall hangings. A white wine for sure. Finally, I got to brag about my Ranch wall hanging assembled after “stewing” on the design wall forever. Now to make the quilting decisions. We were all excited to know that “LINDA is BACK” AND THIS TIME IT WILL BE A NURSERY Ryme story quilt. One hilarious block after another. Each block will have a story, for sure! Our Playhouse Garden group starts off the season with a great brunch at Mary’s house. 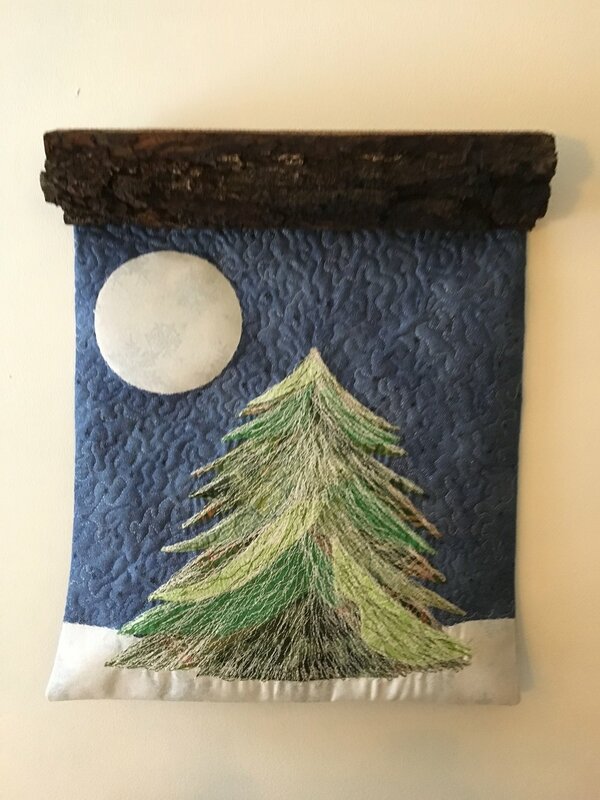 I covet this lovely little tree wall hanging. Just makes one want to start thread sketching at the BERNINA. The rustic hanger adds more to the charm. Six days of snow hibernation led to some necessary activities. First, I promised myself to organize years of collected photos; made a RTAW ( short for Real Trip Around the World) small lavender sample from my own new book and make a pumpkin pie since I gave our new Publix some business for Turkey Time. 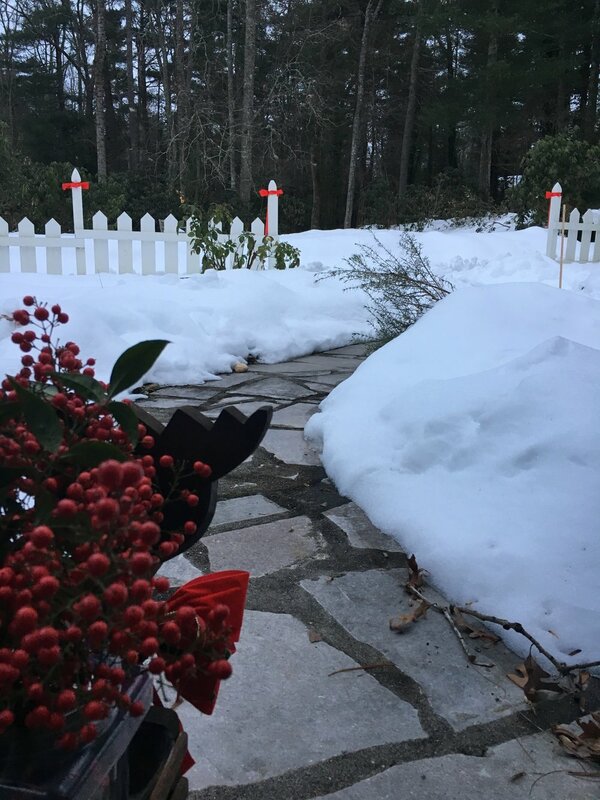 Early on I at least got the front walk shoveled but then it all turned to ice. Oh, welcome rains please some! Marene shared her amazing medallion wall hanging inspired from the Robin Ruth Mariner’s Compass Skinny ruler method. Hope we get to see this in the Asheville Quilt show next year. On the same day I got to coach Abby at the 4-H meeting as she works on her sewing skills with her first flannel quilt. Tea Time at Beginnings Quilt shop is such a sharing time. Yes, we bring and brag along with learning so much. Terryann showing off her doggie bag from denim scraps. More below. Terryann excited about telling us about her Denim Doggie bed. Best hint: Fill the inside with a stuffed pillow case ( in Australia I noted stuffing done with old, clean clothes) that can be removed from the velcro closed bad for laundering. 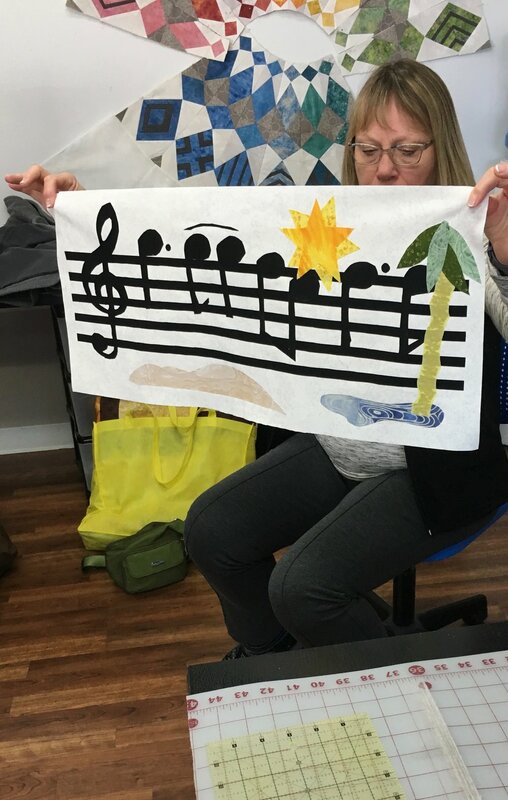 Also Joan shows off a musical patchwork done with nieces featuring musical notes from their marching band; then she reveals a great quilt for her husband done with those 2 1/2” rolls. I got to show off one of my Real Trips Around the World from my new book made especially for my favorite and ONLY graphic artist and his wife. Can’t wait to present this to him along with my book. Just a week or so for delivery!! What to do with a collection of decorators sample fabrics? The secret was to just save the for awhile until they found a home with some leaf pounding fabric done years ago. They all came together mixing the grays and gold tones and even different textures. Always good feeling to finish. Long arm quilted by Susan Caldwell.